The most common comments and questions I get are about styling and grouping things together. 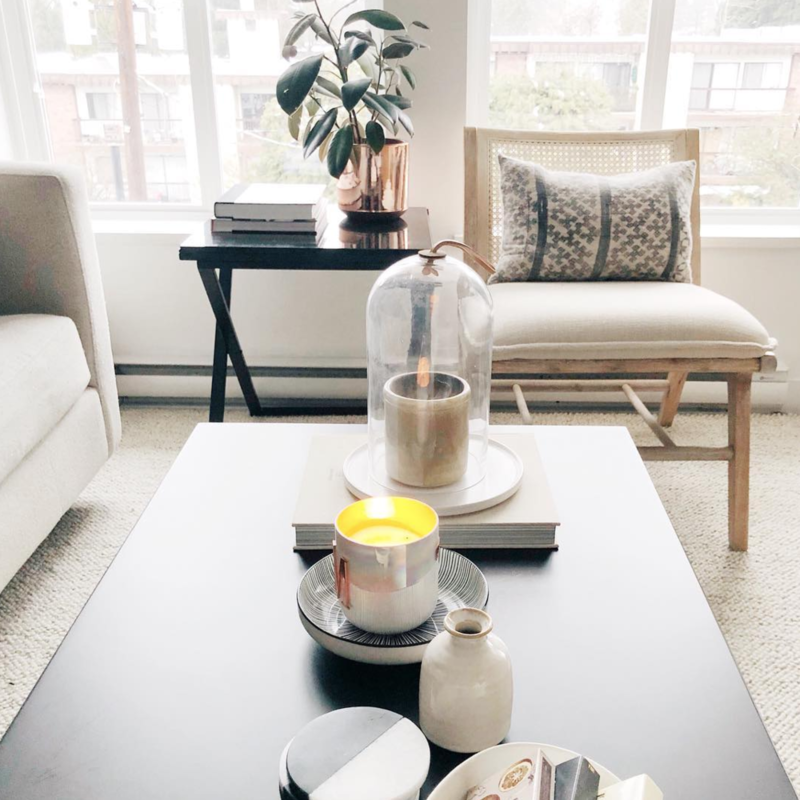 I get this pretty frequently about my coffee table, so I thought I’d share some info about my favourite tips for styling a coffee table. I know that coffee table decor doesn’t always seem practical because like, in real life people like to put their feet up and watch tv (I actually don’t do this, because my legs are too short, ha! - but my husband does for sure) and they don’t want a bunch of “pretty clutter” in their way. We actually used to have an oval coffee table, and it was more narrow than our current one - so I never felt like I could style it properly, or the way I wanted to because my husband always wanted to put his feet up and then where would we put the stuff? So, in addition to wanting to change things up a bit - my main concern was actually finding a coffee table I loved that I could also put things on top of in a stylish way - but also still use functionally. I LOVE our new coffee table (and there will be another post about the updates we’ve made to our living room soon!) and if you aren’t familiar, it is this one; the Burton from Rejuvenation - the coffee table is currently sold out, but the side table is in stock. Once we got our new coffee table, I was OVER JOYED to be able to put an assortment of beautiful things on it, but I needed some coffee table specific items - so actually for Christmas that is what I asked for (perhaps specifically….but I was still surprised, ha!). It’s a great gift suggestion if you are in need of some new decor but don’t really want to spend the lump sum on yourself. Coffee table items are not really that expensive for the most part - so to ask for this collection of smaller items from an array of people for a birthday or Christmas gift can be a great way to get the items you want, without a bigger bill for you. Just an idea! Layer. That might seem strange - but layering is one of the keys to great styling. Maybe its stacking two coffee table books on top of each other, or putting a beautiful candle on a small decorative plate. Layering brings dimension to your blank canvas and can be a great way to get started. Divide and conquer. You’ll want to divide your coffee table into 3. You may be familiar with the rule of thirds from photography or art class - and it applies here. For example, on my coffee table is rectangular, so I’ve divided it into three different vignettes. On the first one I have a coffee table book, a ceramic plate, with a beautiful candle inside a glass cloche. The second is a grouping of a tiny bowl with matchboxes, a decorative plate with a candle placed on it, and a stack of coasters. The third grouping is a coffee table book with a tiny milk jar and a wick trimmer placed on it. Even though the middle one seems like an assortment of random items - and it somewhat is - it’s also three distinct items - keeping it from looking too symmetrical. When in doubt, group items in threes. When placing things together, try to keep things in odd numbers. Doesn’t necessarily have to be three, but I’d just keep it to odd numbers overall; 3 items, 5 small items, and one extra decorative piece on top etc - you get where I’m going with that. When you use things in multiples of 2 it can look a bit too regimented and loose some of the fun and flavour. My only caveat here would be to try and add some variety, don’t make EVERYTHING a grouping of three - it will look a bit forced. But I’d say your ideal combo is going to be about 80/20. Mix textures and tones. In an effort to match I think sometimes stick to the same colours and it can make even the most beautiful designs fall flat. This of course depends on your personal preference - someone may look at my neutral coffee table (and frankly, home!) and think it falls flat in general, but to someone like me, I try to use shades of other warm neutrals to get that full look - and it works for me. With that said, if you’re looking for some hard and fast rules, remember that a proper colour palette includes your main colour, a low light, a highlight and an accent. That is more so when it comes to an entire room - but it can be a good thing to consider when decorating your coffee table. Try making a mini checklist - here’s a quick start: something metallic, something warm (maybe a warm wood tone), something solid, something textured, and something meaningful. Add height. You’ll want to make sure that you’re considering not just the top down view, but the overall height. I love my glass cloche because it adds some height but it doesn’t get in the way. When I’ve had vases on my coffee table before, I’ve felt like they get in the way when watching TV (of course the solution to this would have been a lower vase, but I didn’t feel like buying a new one for that reason) - so it just depends what you use your space for, and where your TV or other seating is situated. Take photos as you go. When you are designing or decorating something it is hard to see it clearly when you’re so close to it. Take a step back, and take a photo. Try it another way - take another photo. Once you feel like you’ve got it to a good place take a look at it in your camera roll on your phone. You’ll notice things that you want to swap. So keep styling, and snapping, and eventually you’ll get it to a great place! Taking photos also helps you remember what you did before and if you want to revert back, you now have a reference to do that. Consider your lifestyle. If you have tiny children, or if you are the kind of person who likes to put your feed up, or use your coffee table as a place to eat your dinner, it probably isn’t the best idea to cover it with beautiful or fragile items. It’s going to turn into a hassle, and those beautiful things will end up sitting in a pile on the floor. So, while I’m all about beautiful coffee table styling, it has to work with the life you actually live! However, even with kids, or with a more multipurpose coffee table, there are ways to style it and make it work for you! I think that’s about it! Remember that “rules” are made to be broken, and I definitely don’t think there is one right way to style a coffee table, I just thought I’d pass on some tips and tricks that have worked for me. I’ve also rounded up some of my coffee table styling favourites, and will link them down below! Finally, I’d love to know what is on your coffee table? Are you a maximalist or a minimalist when it comes to this kind of thing? I’d love to hear!